Happy Saturday y’all! I’ve received so many questions over the years from readers and friends alike, asking for tips on how to start a fashion blog, increase engagement, establish brand partnerships, etc. 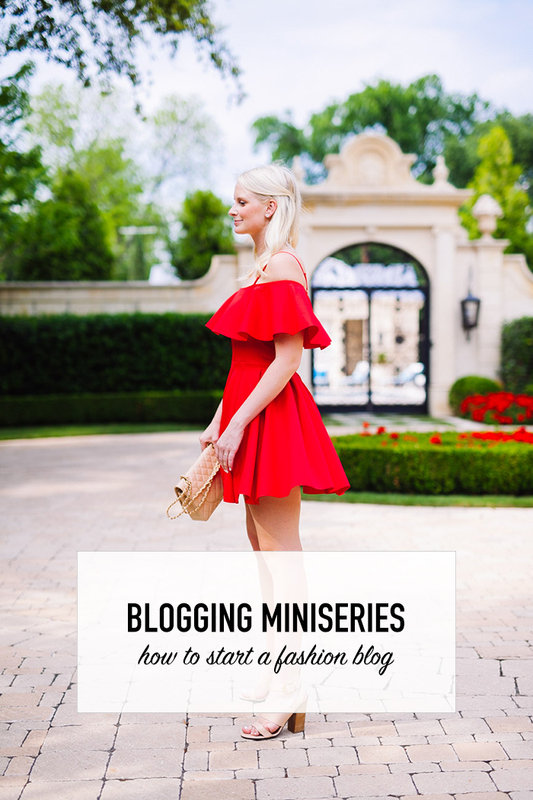 After a lot of thought, I decided to do a tell-all via a miniseries on the blog. This is the first installment! Today you’ll learn everything you need to consider before starting a blog and then how to get one launched! Stay tuned for information on monetizing, growing your brand, and more in the coming Saturdays! 1. How much time do you want to spend on it? Because I post on my blog nearly every day of the week and I’m always posting on each social channel (and sending a daily newsletter), that’s a lot of content I have to produce on a daily basis. While I wouldn’t say “don’t start a blog” if you don’t plan to spend a lot of time on it, if you don’t have a lot of time on your hands as it is, I would definitely consider whether it’s worth it to you. 2. Do you have a unique idea/perspective? This isn’t necessary, but I believe it’s important to truly think about what you can offer a reader and see if it’s unique to what else is out there. The blogging world is so saturated now, so how do you plan to stand out from the crowd? Do you have a talent for beautiful imagery and photography? Is it your hilarious personality that shows through in videos? Do you have an audience niche like fitness or DIY? Are you in a city that doesn’t have any bloggers? Like I said, it’s not crucial to your blog’s success, but it may help you target the right audience up front rather than trying to do all categories and being too vague. You don’t want to get lost in the crowd! 3. Why are you starting a blog? Are you passionate about trends and designers? Or does blogging just sound more fun and like less work than your regular 9-to-5 job? If you’re starting a blog in hopes you can quit your full-time job, I would think twice about starting one. As I mentioned above, it’s a lot more work than you would ever guess, and you don’t make money right away. It took me three years to make enough to leave my job, and even then I was barely scraping by and picking up babysitting jobs here and there for extra cash. I also have to pay for my own insurance and have to worry about taxes every year because a company doesn’t withhold any money for me. 4. Which platforms are you wanting to devote most of your time to? For me, I create the most content on my blog, and then all of my social channels are secondary. On the other hand, I have several blogger friends who have been way more successful on Instagram or Pinterest, and their blog is secondary to the content on those social channels. It really is up to you what you want to dedicate your time to, but I will offer one thing to consider: the only content you own is on your website. I’m sure you heard about the Instagram update that’s surely coming soon – it may disrupt the way you are used to seeing your feed by showing you “popular” posts vs posts in reverse chronological order (like it’s always been). This means the content you used to see everyday may no longer show up in your feed – the fact that Instagram has full control of this could potentially threaten your main revenue stream if you rely solely on Instagram. That’s why it’s so important to have a place where you are sharing content that only YOU can control. It will always be there. With that said, it is very important for brands to see your readers are engaged on other channels as well as your blog. They are looking to partner with bloggers who are influential on ALL of their channels – the blog, Instagram, Facebook, Twitter, Pinterest, YouTube, and now even SnapChat. You don’t need to have an account on all of these channels, but choose which channels you enjoy using and creating content for. A brand will be confused to see you only have 1,000 followers on Facebook but 100K on Instagram. Unless they are working on a targeted social campaign, they are looking for bloggers with a well-rounded audience on each channel. 5. Does it cost money to start a blog? Clothes + beauty products – getting free clothes and products is not guaranteed and should NOT be expected (especially as a new blogger) and it’s not stuff you want a lot of the time, which means you are responsible for buying clothes and products you want to feature on your blog. It can get expensive! 1. Buy a domain and reserve social media handles with your blog’s name – coming up with a good name these days is SO hard, considering how many fashion blogs there are out there. Once you find a name you like and have double-checked it isn’t taken, buy the domain right away! I would also reserve social media handles on EVERY social channel. You may not want to use YouTube right off the bat, but you’ll want your name available to you if you decide to do video in a year’s time. 2. Hire a web designer or customize a theme yourself using WordPress – if you are hiring a designer, this can sometimes take months to create, so just know that if you aren’t doing it yourself, it’s not going to be an immediate process! 3. Buy a camera and all the software you need to edit the photos (or hire a photographer) – unless you have a lot of time to teach yourself how to shoot, I would recommend hiring a local photographer to shoot photos for you at first. That way it’ll give you time to learn the ropes and eventually you can get your friends, boyfriend or another blogger friend to help you shoot. 4. Come up with an editorial calendar – it’s a good plan to at least have a vague idea of the types of posts you plan to do. For example, I do outfit posts on MWF, THE EDIT is always on Tuesday, etc. If you have a calendar, it will help hold you accountable for posting consistently. 5. Start posting content consistently on each channel before you announce your launch – I would recommend having about two weeks of content live on your site and social channels when you launch your blog and announce it to your friends and family. That way when they forward your blog and Instagram (etc) on to other people, they’ll already have an idea of the content they can expect to find on your site. And that’s it! From there it’s all about posting consistently and growing awareness. Tune in next Saturday for the next installment of this blogging miniseries: How To Grow Your Readership + Increase Engagement! If you have any specific blogging questions, please email me! In the last installment I’ll be answering all of them! Thanks so much for sharing this Merritt! It’s great to hear advice from such an established blogger. I think that’s so true, you can’t just expect to make money, you have to really love it. I’ve only been blogging a few months, but with the amount of time and effort it takes (esp. when you also have a FT job), if I didn’t love it, I don’t think I would have stuck it out or it would be worth it. So glad you are doing this series! please stop perpetuating the lie that Instagram won’t show all the posts from your followers in your feed. it is simply not true. all the photos will be there, they will just be in a different order. if you consistently like a user’s photos, they will be at the top of your feed. if you don’t like someone’s photos very often, they’ll still be there — you just have to scroll further down. this information is literally right on instagrams website and mentioned in countless articles!! do your research before you post. I’m not saying that they have made that exact change. The point I’m making is how they have full control over the content you post. If they wanted to change the algorithm, they could do it! Just like Facebook and Pinterest have – it’s a known fact. So rude, Allie- not necessary!!!! I am really pleased that you are sharing your tips with us. It is a gracious thing to do, after all, you have put in a lot of time and hard work! Wonderful and insightful post !! This was good! Looking forward to the next one in the series. I need help with growth for sure. Staying tuned. Great post, Merritt! Lots of useful insight and honest tips here! It is very generous of you to share tips and advice to your readers I for sure appreciate since I have contemplating starting a blog since 4years but never did because didn’t know where to start. The person commenting about the Instagram is just being rude and not adding any valuable criticism! Hi! Thanks for sharing your insights into blogging. I stumbled onto your blog about a year ago, and love your content. Random question…What foundation brush do you use? I saw you mentioned it on Snapchat, and didn’t take note, and then can’t find it. Thank you! Beautiful blog! Love you on Snapchat too! Just subscribed to your email newsletter. Love seeing pics and snaps from my home state. Cheers! This is so go good. I would recommend the same things! What a timely and well-thought out post! I’m really looking forward to the next installment. That’s an interesting point you make, that fashion blogging requires you to buy the clothes and products you feature on your blog (I had always wondered about that – assumed most products were gifted). Thank you for such an insightful and thorough first installment. Wishing you continued success in the blogging world! What a nice thing to do! You have so much knowledge and insight to offer those considering starting a blog. It’s certainly not as easy and simple as it looks, especially these days! Well done, Merritt. Really helpful post! It can help a lot, even i one already has a blog! Thanks for sharing! Enjoyable read, even for men. Loving this series- it’s so helpful! What hosting site(s) would you recommend? Thanks SO much for this read- not only was it super informative, but I learned quite a few things I hadn’t know from researching about blogs myself! It is such a passion of mine, and thank you for sharing a glimpse of yours. I intend to start in 3 yrs so it’s important that I’m learning all that I can to prepare now!